Told through the eyes of Jack(ie)'s older sister Susan, Jack (Not Jackie) is a compassionate look at gender variance in young children. Susan is so excited to have a little sister but slowly it becomes clear that Jack(ie) isn't interested in the same things Susan is. After many instances of Susan trying to correct her younger sibling's gendered preferences (with gentle reminders from her parents that it's "Not wrong, just different" and "We wear what feels right"), Jackie finally makes it clear he is a boy and wishes to be called Jack. Although initially upset, Susan realizes her younger brother Jack is still the same sweet and giggly kid he always was. 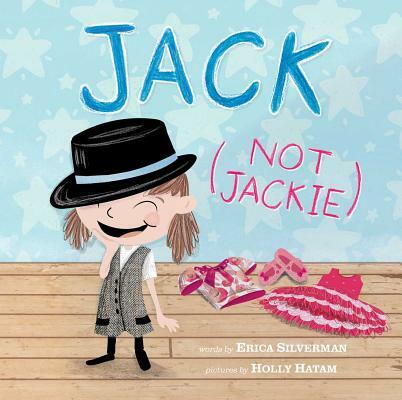 Complete with resources in the back so parents can continue these conversations with each other and their kids, Jack (Not Jackie) is an important addition to the growing genre of pictures books tackling the issue of trans and gender variant children with insight and compassion. In this heartwarming picture book, a big sister realizes that her little sister, Jackie, doesn't like dresses or fairies-she likes ties and bugs! Will she and her family be able to accept that Jackie identifies more as "Jack"? Susan thinks her little sister Jackie has the best giggle! She can't wait for Jackie to get older so they can do all sorts of things like play forest fairies and be explorers together. But as Jackie grows, she doesn't want to play those games. She wants to play with mud and be a super bug! Jackie also doesn't like dresses or her long hair, and she would rather be called Jack. Readers will love this sweet story about change and acceptance. This book is published in partnership with GLAAD to accelerate LGBTQ inclusivity and acceptance. Erica Silverman is the author of the Cowgirl Kate and Cocoa early reader books, the first of which received a Theodor Seuss Geisel Honor. Her other titles include When the Chickens Went on Strike, Big Pumpkin, The Hanukkah Hop!, Don't Fidget a Feather, and Wake Up, City! She loves writing, reading, and researching. She has a master's of library and information science and is a librarian and a children's book author. She lives in Los Angeles, California. Learn more about her at ericasilverman.com. Holly Hatam is the illustrator of the #1 New York Times Bestseller, Dear Girl. Her other picture books include Made by Maxine and Tree Song. Holly lives in Whitby, Ontario, where she can be found hugging trees with her husband, Stephen, and son Linden, stuffing her pantry full of tea, and sticking her nose in the occasional book. This is arguably the only male transgender story for younger children and important accordingly. Silverman handles her sensitive material extremely well, with a light, non-didactic touch. The spirit of the story is nicely augmented by Hatam's sprightly cartoon illustrations. A helpful appended author's note offers context for the story, which belongs in every library.